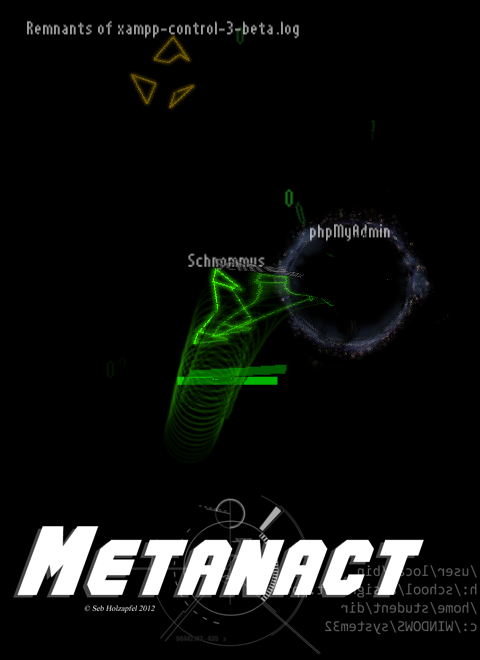 Folders as portals, enemies representing real files, a convoluted story, collectible loot, unlocking of directories, scoring & customizable ships: Metanact aims to be a fun way of taking stress out on your files. To promote Metanact - Spaceshooter in your filesystem and grow its popularity (top games), use the embed code provided on your homepage, blog, forums and elsewhere you desire. Or try our widget. This is a binary release. All desired features aren't all implemented; but you can definitely see how the game plays.